Most people realize that study is not the same as training. It is not wise to prepare for climbing Mt. Everest by only reading a book about it. Your knowledge will be improved and you may bring the correct tools, hire the right guides, etc., but your body needs to be physically capable of climbing that height. You need a certain amount of muscle, blood cells and other physical capabilities to accomplish that task. Building those muscles and capabilities requires training. Practice is also not the same as training. The distinction here is more subtle but just as important if you want to achieve maximal results. Let’s start with some definitions. Training – Expanding your physical, mental or spiritual performance by systematically exceeding your current capabilities in a way that induces micro-stresses that stimulate growth. Training improves your capabilities of performing a wide range of tasks (i.e. improve bio-mechanical integrity, strength or endurance). This increased capability can then be applied to improve your performance in playing golf. Training is analogous to Basic Research (as opposed to Applied Research) in that it improves your body’s basic functioning. Practice – Improving the consistency of accomplishing a specific activity through repetition. Generally, practice mimics the end goal sport or activity (i.e. practice rounds) or some sub-set of the sport / activity (i.e. chip shots at the driving range). Practice is analogous to Applied Research rather than Basic Research in that it improves your ability to perform that specific activity. Many organizations, teams and artists practice but never train. This is unfortunate because that results in sub-optimal results. Let’s look at some examples of groups that generally practice or train or both. Military & Police – They generally do both training and practice. 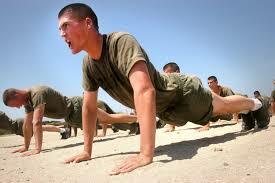 In boot camp and beyond, each soldier is trained to improved their physical capability. They run, do push ups, crawl, etc. At some point, they will also do ‘war games’, hostage drills or marksmanship to practice situations that mimic actual combat or police situations. They do not do push ups so that they can drop and do 50 on the battlefield. They do push ups so that they can accomplish many different activities better. Professional Sports – Almost all sports organizations do practice in the form of games or sport specific drills. The utilization of training however, varies from sport to sport. Football and gymnastics are known for including a lot of physical training in their preparation while other sports such as golf or bowling typically include much less. Performing Arts – Dancers, musicians and actors are very heavily oriented towards practice only type of preparations. It is the rare dancer or drummer who also does joint balancing exercises to improve biomechanical strength or cognitive training to improve focus and multi-tasking abilities. Casual Athletes – The person who plays a few baseball games each summer typically does neither training or practice. They don’t do practice games or practice drills to get ready for competition play. They may or may not do exercises to improve their overall capabilities. Improving your maximal potential performance requires inducing microstresses in a way that stimulates growth. This growth can be in your muscle size, neurotransmitters, vascularization or any human characteristic. When you want to build muscles, it is necessary to stimulate growth by introducing small tears in the muscle. This stimulates the body to repair the damage and make it a little bit stronger over the next few days. Note – We are not talking about introducing so much damage that you are injuring the muscle. This typically takes multiple weeks to recover from. When a golfer plays a round or practices, they tend to do motions in a way that does not approach the threshold necessary to stimulate growth for most of the tissues involved. This results in a few muscles getting stronger while the vast majority do not. One way to reach the activity threshold necessary to stimulate growth is by deconstructing the golf stroke into its’ component parts and exercising each of them separately. Once each component has been stimulated to reach the desired amount of growth, the stroke is reconstructed to achieve a new maximum level of performance. One side effect of only doing golf rounds or practice drills is that joints are developed unevenly. This results in imbalanced joints that stretch to one side. This movement of the joint fulcrum from its’ optimal central point introduces joint instability or even clicking which diminishes accuracy. This instability introduces another variable during each stroke that gives inconsistent results. It’s like doing target practice at a shooting range during an earthquake. A fulcrum shift in the middle of a stroke can have unpredictable results. Proper training for golf would involve testing: each ligament for laxity; each joint for ranges of motion and integrity; as well as every muscle for balanced strength before beginning any program of stretches or exercises. Joints that have imbalanced muscles or ligaments that get stretched beyond their normal ranges with have faster than normal joint degeneration. This involves pain, swelling and a shortened career. Golf is a very one-sided sport which means that it is harder on the body than balanced sport activities. On any given year, 15-20% of all golfers have a significant injury. If you want to enjoy golf well into your golden years, or extend your income producing professional career by more years, implementing a proper training regimen throughout your golf life is a major factor to consider. Practice will lead to improvements in power, speed, skills and overall golf performance. By incorporating training as well as practice into your golf preparations, your maximum results will be improved to higher heights in a quicker time frame and your career will be extended for longer than it would be without training. Previous Previous post: How Do Muscles Get Larger?